Come check out some fresh new flavors of ground breaking music by talented musicians from around the area. 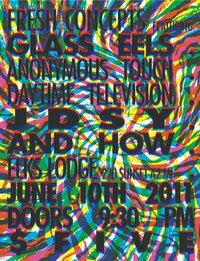 Glass Eels, Anonymous Touch, Daytime Television, JDSY & And How (from Chicago) will be filling the Elks Lodge with all types of new sounds that are sure to fill your appetite. It will be a good time to see friends and have a nice time. See y'all there! Should be a fun time.